If the goal is consistently getting killed or damaging the Viper beyond recognition during landings, nothing is better than following the manual (both the original and the Allied Force version) to the letter. Back in the good old days of the original Falcon 4, I remember myself landing the Viper easily. It was hard to learn, but after serious practice landings were not a worry. After recently getting back into the cockpit, the cold sweats on final were back. I knew I knew something back then, Donald Rumsfeld would say about my lack of memory. But I couldn't remember what is was. So I dusted off my original Falcon 4 printed manual and found a lot of notes about different topics. Nerdy, I know ... Just don't tell anybody I keep notes about games. About landings, a scarce drawing with a flight path marker and the angle of attack bracket perfectly aligned, as they would show up in the heads up display. A note on the side says "keep them this way". Aha! I took that from a discussion board sometime in the past. Google to the rescue, and there is this webpage which explains it best. It's that freaking-simple: check the glide slope, start from a reasonable airspeed, deploy landing gear and put the flight path marker on the edge of the runway. Then, adjust throttle to keep the flight path marker so it is between the angle of attack bracket. As the author of the webpage above says, you don't even need to check your airspeed because it will be right at where you need it for landing. If you keep the damn flight path marker within the bracket, off course. 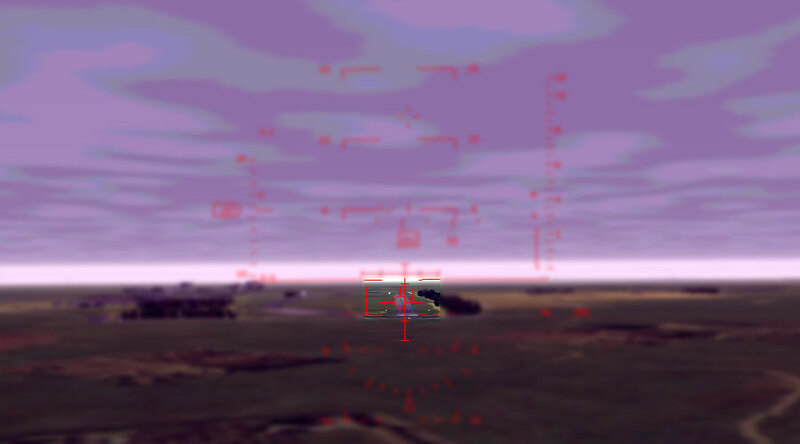 Click it to see it: the only stuff in focus are the fight path marker (the circle with three lines as if they were the tail and wings of an aircraft) and the angle of attack bracket (to the left, a vertical bracket). On final. I can almost smell from here the stale cigars and beers at the o'club. I'm curious -- what made you go back to Falcon 4.0? I occasionally flirt with the idea before remembering the hassle I went through trying to get my 1920x1080 monitor work well with Aeyes' add-on pits and then giving up. And at this point, aside from the dynamic campaign, I can't fathom what F4 has going for it, in terms of study-sim fun, that DCS: A-10C doesn't. You also need to fly within the ILS cone - in your shot you are on the very lowest edge of it, and are in danger of penetrating the obstacle clearance floor - IRL there is a good chance of striking antenna/buildings/trees if you are below the minimum clearance altitude. You do have some safety margin, but are pushing the edges a bit. The same AOA/indexer setup, but with the ILS glideslope & localiser beams crossing at their centres is what you should aim for. Once there you can then safely ignore the ILS except to monitor for the clearance limit, but you shouldn't be making an approach from so low. To correct it from there.. note your current pitch and throttle setting. Hold pitch and throttle steady, and close the airbrake for long enough to see the ILS converging on the centre @ around 50% error taken out re-open the airbrake and wait for ILS beam, AOA and airspeed to settle. You should now be near/on the correct place on the ILS glideslope, and at your original airspeed and AOA. If necessary (or you want to) you can repeat (using the shorter time to again take out 50% error). If you consistently find that 50% overshoots the ILS centreline, or leaves you too short, then you can decrease or increase (resp) the time you leave the boards closed. I've been thinking about firing up F4 again. I have flown dcs a-10 but the viper is so much more versatile in it's mission. Plus I love doing SEAD missions, launching anti radar missiles something the a-10 can't do. Thanks for your comments, gents, and sorry for the late response. @GregP: Actually, I never stopped flying this thing. This sim (in one or other of its multiple reincarnations) is the only one that was in all my computers' hard drives since the release time. Always vanilla versions, as I don't have the time to keep myself updated with all the new stuff. @ Lieste: Thanks for that. Do you regularly use the brakes during approach/landing? @ Anonymous: The Falcon gives multi-role fighter another whole meaning. 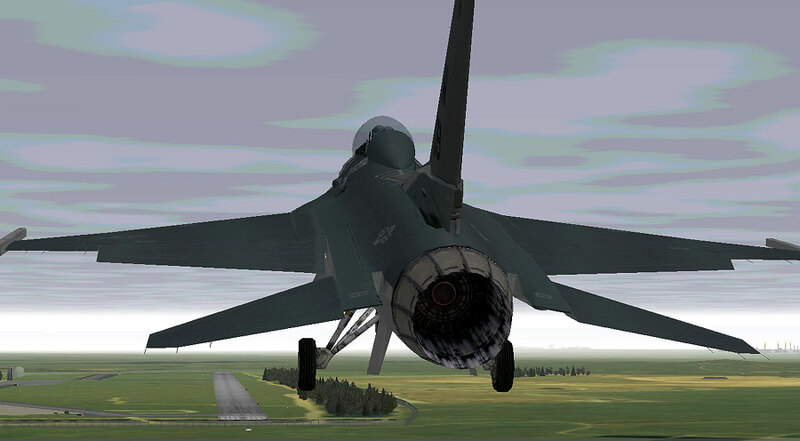 In practice I'd fly a stabilised approach with full flaps, airbrake (70%?) open and thrust mid-high. If you fall below the flight path you can more rapidly 'add' excess power by closing the brakes than by spooling up the engines. Reducing flaps is bad due to sinkage/possible stall, and rapid throttle movements can increase engine failure risk. Not specific to F4, and the controls may not allow partial brake employment... in this case I'd approach with them open, but possibly be a hair low on power, intermittently closing them to track IAS correctly. With power in the correct 'range' you may never need to touch the pitch or throttle on the approach at all, flying the whole glideslope on the airbrake. 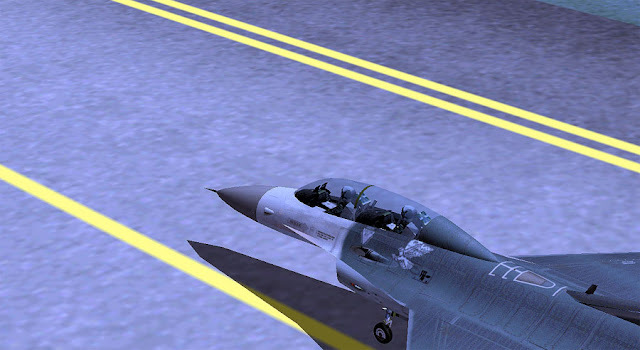 With some of the more effective spoiler/airbrake designs, you might be able to enter a valid climb profile from the approach just by closing the airbrakes fully, allowing the pilot to maintain concentration and a safe go-around without large changes in configuration until a steady (low rate) climb is established... closing flaps and sinking, or raising the undercarriage while still descending close to the ground might cause a ground collision, and engine stalls/failures are a fairly frequent result of real-world rapid power changes with 'overcooled' engines. Please help me, I can't seem to stop the plane once I touch the ground even if I activate speed breaks (b) and put throttle to idle. Is the wheel breaks (k) toggle or hold? Press and hold "k" for the wheels brake. After all the wheels are down, I push the stick forward until the speed drops down to <100 KIAS and the stick back from there. Are coming in too fast?